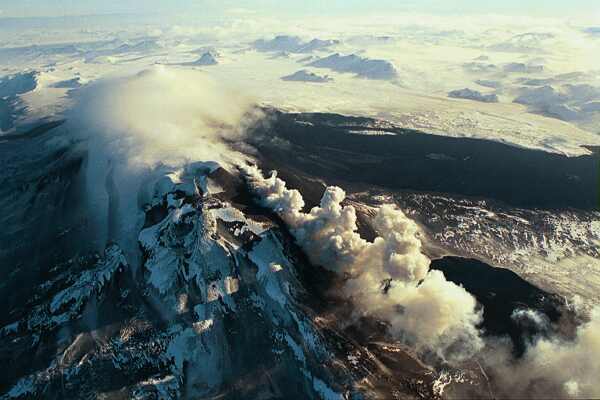 Hekla is located in south Iceland where the South Iceland Seismic Zone intersects the Eastern Volcanic Zone and is characterized by eruption of intermediate to silicic magma. It is a volcanic ridge, but the view along the volcanic zone reveals the profile of a perfectly shaped stratovolcano. The central volcano is superimposed on a basaltic hyaloclastite basement, probably produced in the last glacial period. Basaltic lavas are also produced in effusive eruptions on a parallel fissure system. Hekla has been active since the early Holocene, featuring several large silicic Plinian eruptions as well as smaller sub-Plinian eruptions forming two-coloured tephra layers of rhyolitic to andesitic composition. The best known and largest explosive eruptions producing only tephra, occurred roughly 7000 years ago, 4200, 3900 and 3000 years ago, and the last one in the year 1104 AD. Several smaller explosive eruptions occurred in this period, but information on lava production is scant. In the period AD 1200-1900 Hekla produced one to two eruptions per century. Each eruption began with a sub-Plinian to Plinian tephra-producing phase of andesitic to dacitic composition and in many eruptions this was followed by a longer-lasting phase of lava effusion. The composition of these lavas ranges from basaltic andesite to andesite. This eruption pattern changed in the latter half of the 20th Century, and since 1970 Hekla has produced small basaltic andesite to andesite eruptions every 9-10 years. Historical eruptions from the Hekla volcanic center, including the eruption 1104 AD, are 18 as counted by detailed tephrochronology and historical records. The dates are; 1104, 1158, 1206, 1222, 1300, 1341, 1389, 1510, 1597, 1636, 1693, 1766, 1845, 1947, 1970, 1980, 1991 and 2000.